Thank you for visiting Bengkung belly binding wraps by Your Birth. Here you’ll find how to videos, frequently asked questions, and links to articles about belly binding. Heather is a DONA International Certified Birth Doula, a Lamaze Certified Childbirth Educator, and a Bengkung Belly Binding trainer. Learn to wrap at one of her training sessions and birth workers can earn 1.5 DONA Contact Hours. Hand dyed wraps are made from 100% cotton muslin fabric and are aproximately 9 inches wide. Batik wraps vary by print and are 100% Indian batik which look great on both sides. Your Birth wraps are handmade and the edges are serged so they’re machine washable and can be tumble dried. Bengkung belly binding is a traditional Malaysian method of binding the belly and hips to promote healing and wellness. Bengkung belly binding for postpartum women may help reduce lochia, repair diastasis recti, and provide lower back support by improving posture. Diastasis recti is the separation between your abdominal muscles during pregnancy which may result in a small vertical gap down the center of your belly. Binding can help bring those muscles back together. It’s not hard to learn and my videos make it easy, but it does take some practice to become proficient. After just a few wrappings you’ll be able to bind yourself in about ten minutes. This is so beautiful. I could not wait till I was postpartum to try it on. It’s so supportive on my pregnant belly. It feels great to wear it. It’s great quality and the seller was fabulous and friendly and easy to work with. I’ve already recommended this product to three other gals I know who are pregnant! I am a Rebozo fiend now! I have used this in 2 births now. Both on the same day actually!! Already ordered a second. This works better than the ‘authentic’ one. It’s more manageable. Totally recommend. Heather was very helpful with recommending a length to suit me, and the wrap is beautiful, I *Love* the wine color! !This hemmed belly wrap doesn’t roll and dig in at all and will be much more comfortable to wear for extended lengths of time. I’m really excited to start wearing this beautiful wrap after the birth of our second! A friend give me her old bengkung wrap after I had my first child but it I didn’t wear it because it wasn’t long enough and the edges weren’t hemmed like this so they rolled and bunched up, plus they were fraying and it was just awful. This wrap is so nicely made. Thank you!! The baby arrived early but this was in the mail box the day after we got home from the hospital. I haven’t perfected the wrap yet but your videos are easy to follow and I’m slowly getting the hang of it. Your Order is Doing Good Things! All content provided by Your Birth on the bellybinding.com, avdoula.com, or Your Birth on Etsy at yourbirth.etsy.com websites are for informational purposes only. No information provided by Heather Turner or Your Birth in any medium shall be construed as medical advice. No claims to treat, cure, or prevent any disease, illness, or condition is implied either implicitly or explicitly. Always seek the advice of your physician or other qualified health provider with any questions you may have regarding a medical condition. Never disregard professional medical advice or delay in seeking it because of something you have read on this website or information provided by Heather Turner or Your Birth. Basically, what I’m saying is that I’m not a doctor so I’m not giving you medical advice. Also, I’m not trying to claim that Bengkung belly binding will fix any of your medical problems. I’ve had many happy customers who have reported that belly binding has helped bring together the separation of their abdominal muscles after childbirth (diastasis recti,) provided support for lower back problems, helped slow the bleeding after childbirth (lochia,) and even helped with headaches and arthritis. However, I make absolutely no claims that belly binding will do the same for you. Heather is a Bengkung Belly Binding trainer. She travels across Southern California and the nation and can issue DONA International contact hours for birth professionals. Learn belly binding and offer a new postpartum service for your birth clients. The wrap came in fast and is beautiful. I loved the card she sent with the wrap. 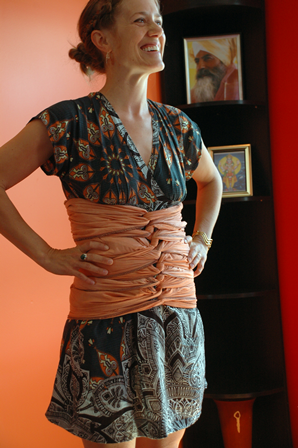 I am adding belly binding to my doula business and think I have found my go to shop for wraps since I do not have the talent to make them myself.